As is VAE custom each year the President of the years gets to award a special trophy for a member-restored car that he/she feels is a great restoration… and quite often a car of period that the President is somewhat partial to. 2003’s winner is hereby announced by 2003’s VAE President and in light of the above it may come as a surprise of sorts. Rumor has it that Gael believes that no car younger than he is, is really an “old car”. He has also disparaged some quite respectable marques, especially those with flat head six cylinder engines. This is probably more to tease some specific club members… doesn’t 2004 President Ray dote on those Mopar marvels? Back to what may be a surprise. 2003’s winning car wasn’t off the assembly line when Gael graduated (yes, he did), from high school. But time has passed and 1957 was an interesting car year. The trophy goes to Gary Sassi of Barre, Vermont for the super restoration of his 1957 Studebaker Golden Hawk. You’ve seen his Stude Speedster and admired its perfection… well the Hawk is even better. Gary claims that he learned a lot on the speedster to the Hawk’s benefit. Gary’s enthusiasm is contagious and I’m sure that he would welcome you, as he did me, into his garage and workspace and let you see just what kind of concerted effort he invests in his cars. He does a majority of the work himself and gets a hand with paint, plating and other things that are hard to do in a garage that is actually an extension of his living room. So thanks Gary, congratulations, and a tip of the VAE hat for a great job on a neat car. What’s next? History tells us that the mechanical marvel of a geared differential preceded the automobile by many years. Some really ingenious guy “thunk” up the differential and made working models in the middle of the 19th century. Here was a great “future problem solver” with no great immediate use. When the horse pulled the wagon there was no need to appropriate power to speed and distance. The horse had his own internal differential. It wasn’t long after self-propelled stuff began turning up that the differential really came into its own. Consider the problem of belting or direct-connecting just one rear wheel to the engine. You may have made a soapbox type rig in your youth like that and will agree that one-side drive isn’t great. The single driven wheel spins easily and the vehicle handles poorly. Enter the differential. You need charts or a cut-away model to fully grasp this clever item. But what it does is to allow both wheels to receive power. And that power is proportioned to the amount of resistance the wheels are receiving back up from the road. When a car is under power and is going around a curve, the outside wheel has to travel much further than the inside one. But there is more resistance on the inner wheel. Both wheels need power for smooth performance and good handling – and the differential does this. As the wheel resistance increases, spinning gears in a small cage attached to one axle, allows the axle speed to change in relation to the other axle. “Compensation” is the best word to explain the theory but you’ll need to look at some diagrams. Or better yet, go down to the junkyard and give the guy $2 bucks to let you pull the cover off an abandoned differential. Oh, take the charts and diagrams with you. It isn’t real complicated but the darn thing is so clever that you will be a few minutes sorting it out. To yet again quote a VAE founder, Bob Jones, “A good president should do nothing.” This re-occurring thought has served this year’s President pretty well… thanks to the exceptional efforts of the other officers, directors, show chair-people and those contributing to the committee work necessary to operate the VAE. There are, however, several tasks that do need attention and are also really interesting. One is to select a favorite from VAE member restored cars. This should be a car restored or at least completed in the current year by a member who was seriously involved in the restoration personally. This doesn’t mean that the owner did all the work them self… or polished a high-point car that somebody else has resurrected. The award should be eligible to a this-year’s restoration that was overseen by the owner and where the owner contributed personally where his or her talents allowed. That said, there should be a number of candidate-qualified vehicles to be considered. The President should then look at the cars, get the restoration story from the owner and make a personal decision on the car (or vehicle… could be a truck, bus, etc) and award a Presidential trophy. Here is what you need to do. Nominate yourself and vehicle if you could be a contender. Or if bashful, nominate someone you think is deserving. Send those nominations to: Gael Boardman, 252 Upper English Settlement Road, Underhill, VT 05489 and please do it soon. What a great opportunity for the President guy to get to see some great stuff up close… and what fun to win some recognition for a great job on a great car. Do it today. Regular readers will know that during our 50th year (2003) Wheel Tracks has been sharing information on some of our most special members… those that have by their time, ability and continued work, have won our “Big E” award. We all are Vermont Automobile Enthusiasts and the Big E is for Super Enthusiasm. Who is Mr. Flea Market of the VAE? It’s Tom McHugh of course. Tom has been doing the flea markets for all shows for many years. Before completing requests for vendor spots for the Shelburne show, he is also receiving requests for the Stowe show. It is now small task to handle the correspondence, phone calls and emails. Tom goes to Stowe a week previous to the event to get everything organized. For instance, he draws a good size map, which shows the location in the field of every vendor. It is a most convenient sort of reference. The trailer has become an information center. Tom joined the club in 1971, did the offices and served as president in 1974 and again in 1989. He has hosted home meets with chicken BBQs, planned mystery tours, and worked on Wheel Tracks to name a few activities. In other words, you name it and he has done it for the club. With his committee, he has just finished the Book of the Fiftieth Anniversary of the Club. A lot of hours were spent on this project. As a result, we have a wonderful book of VAE history, which also includes many fine photos. The membership is gratefully appreciative of all the work and effort involved. Tom is retired from General Dynamics but has gone back to work for the company again. Besides his interest in Antique Cars, of which the Oldsmobile is his favorite, he also collects antiques and is interested in genealogy. Somehow he finds time to be a volunteer tour guide for Ethan Allen Homestead in Burlington. Tom is a busy person, but never too busy to help or chair an event for the VAE. Oh, and don’t forget his bean hole beans! The Club extends condolences to Tom and his family on the recent death of his granddaughter, Jennifer. Congratulations Tom for work well done and thanks Gen, for reminding us that it is people like Tom McHugh that keep the “E” in the VAE. Fifty years can generate quite a lot of history but like any history there are defining moments. As the VAE reflects on our past 50 years there have been a number of things and people that have shaped our direction and progress. We have mentioned several of these people here in Wheel Tracks during out golden anniversary… all true great Enthusiasts. This month’s task is harder than usual because of the size and scope of the subject. We wish to recognize our “Canadian Connection” and the help and support we received from our Northern friends in our beginning and as they continue to be a big part of our major car shows. Thanks to one and all of you enthusiasts. That said and meant, history reveals that there were a group of really outstanding Canadians who contributed to the VAE very early on. They showed us how to organize our fledgling Stowe car show and what to do to attract participants and the public. They taught us about classes and judging and lent a general sophistication that we might have never developed without them. They also had some outstanding cars. The following may bring back memories for some of our older members: Ian Jameson, Ian Hodge, Hugh Jockel, Don Kelso, Louis Gravel, Diddie Dunn, George Stead, Steve Weid, Ron Pickering (still an active member) and Hugh Durnford. It is the latter that gets this month’s Big E Award, however. 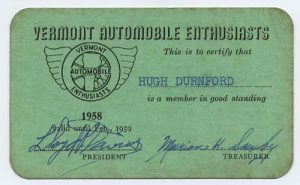 Hugh Durnford got a lot of hands-on car club experience as a founding member of the Vintage Automobile Club of Montreal and was eager to help out the new Vermont car club, the VAE. At the time his “driver” was a ’29 Packard roadster and the project was an early Dodge Brothers touring car. There was also a Kissel Gold Bug 1923 and a 1919 McLaughlin (think Buick) in the wings. Hugh went on to become the authority on McLaughlin. (VAE member Ray Unsworth has one of these sturdy cars.) At the age of 12 Hugh wrote an essay on Vintage cars; at 16 he owned his first example. 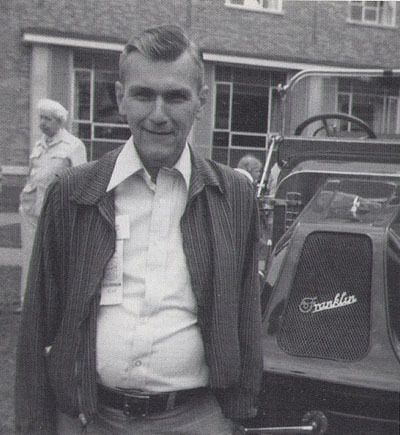 He co-authored the book “Cars of Canada” and made many major contributions to the hobby. Hugh’s death at 48 in 1979 was a shock. 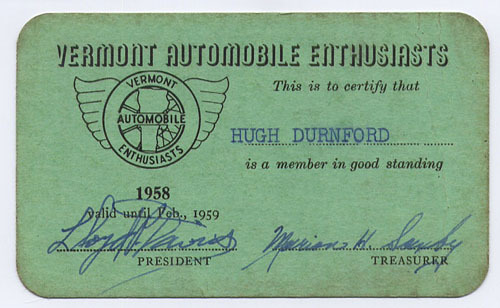 The old car hobby in both the US and Canada owe Hugh a lot… but the VAE and its members owe him even more. Recognizing Hugh Durnford with our Big E is little and it’s late but it’s truly deserved. Hugh Durnford, managing editor of the book department of the Reader’s Digest Association (Canada) and for 20 years, a Montreal Star reporter, writer and editor, died suddenly Friday at the Montreal General Hospital. He was 48. 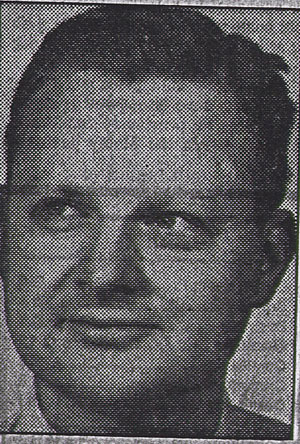 Hugh Mckenzie Elliott Durnford was born in Montreal in 1931, the son of Col. And Mrs. Elliott Durnford. He was educated at St. George’s School, Trinity College School in Port Hope, Ontario and McGill University, where he graduated in 1953. Hugh served the Star in various capacities from 1954 to 1974 and then joined the Digest as a book editor. An ardent lover of Canada, he took special delight in heading the team that over a two year period produced Heritage of Canada, a popular history that was subsequently published in French as Heritage du Canada. 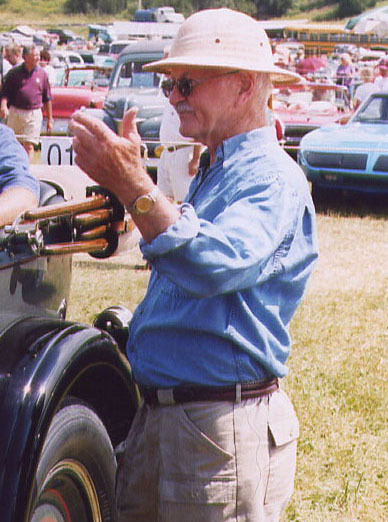 Mr. Durnford was a founding member and former president of the Vintage Automobile Club of Montreal and for years edited its magazine, Le Chauffeur. He is survived by his wife Nancy, three daughters, Sally, Megan and Kendra, his mother, Mrs. Amy Durnford and a sister, Mrs. Jacis Stead, all of Montreal. Funeral service will be at 2pm Tuesday at St. George’s Anglican Church, thence to the Mount Royal Crematorium. It is interesting to note that both Lloyd Davis (VAE President in 1958) and Marion Saxby (Treasurer in the same year) who signed Hugh’s membership card for that year, are also both “Big E” award laureates. Hugh was in good company when he joined us in 1958. Ron Pickering with some help from Graham Gould and Hugh Durnford’s widow, Nancy, have agreed to work on an additional article about our Canadian Connection. Look for this interesting history in upcoming Wheel Tracks issues. If you have anecdotes or information about our Canadian friends, the VACM, or events we shared, please send them along to Ron, Ellen Emerson or Gale Boardman. We’d love to share the information. And look for another “Big E” (for super enthusiasm) in next month’s newsletter. You may have noticed that rewards are not always immediately following performance just as punishments don’t necessarily happen right after crimes. It would be nice, however, to think that in the long run we all got at least what we deserve. Some of our “Big E” awards are a little late in coming but this month’s award is undisputedly deserved. Lloyd Perkins Davis gets a BIG E for his 50 years with the VAE. Years ago some wag said that the L.P. in Lloyd P. Davis was for “long playing” (it might have been Bob Jones). Lloyd has been long playing, in its best sense, with our car club. His own interests are wide and included in his personal collection are a Chalmers Detroit, Franklin, Ford T, a Packard and a very unusual Davis car. Like many members he probably also has a secret stash hidden away somewhere. As a charter member Lloyd has had a long and significant career with us. He has held office, organized meets, helped us plan and has brought us help and experiences from some of his other affiliations: The Franklin Club (where he is an active and respected member) and the AUHV (the Automobilists of the Upper Hudson Valley). The latter were a lot of help to the VAE in its early years and recently we have tried to involve them in our activities once again. It was Lloyd that really helped got us going with our first “film night” in years last February and it was from his personal collection of old film that we got another look at Oliver and Hardy and other assorted mechanical mayhem from the silent film era. Many an early VAE meet came out of Lloyd’s archives of film and many a member came and stayed with the VAE because of his interests and example. We don’t see Lloyd at as many meets as we used to… Rutland is quite a commute. But our older members know that Lloyd is just a call away for help and advice. We know that he will turn up, often a little late because of “chores”. We recommend that newer members get to know Lloyd. No one has more old car “enthusiasm” and Lloyd’s sense of humor makes any conversation a lot of fun. Just ask him about the dog, the flat tire and the jack; all in greater Hardwick some years back… an adventure with Lloyd Davis Commentary. Lloyd could also tell you all about the Bomoseen Auto Museum, now closed and gone, as he was its advisor. Or some Glidden tours… or almost anything else. Thanks Lloyd for our first 50 years of help and friendship. We’re looking for many more. Here is a great BIG E for you. Adding to our roster of Vermont Automobile Enthusiasts, this month the “BIG E” goes to someone who is already a “Hall” of Famer… R. Avery Hall. When you stop and think about it for a minute there are few who have devoted as much time and effort to the VAE as Avery. In addition to his club contributions, he has also managed to pretty well preserve several worthy vehicles. His work is an inspiration for us all and having a national prizewinner at many of our meets is a big plus for members, guests and the hobby. None of this happened overnight. R. Avery (think “our” Avery) has had the bug for some time. 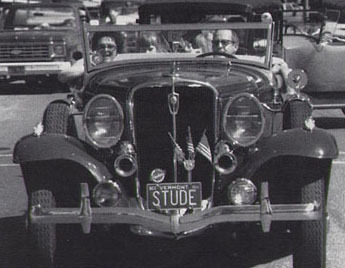 Although he now tends to deny it, there is evidence in the 40th anniversary publication of an early interest… Avery appears in print in a Model A Roadster. He denies a Ford-inspired old car career but we know better… Ford has always outsold Packard, Avery and look what a used Model A has done for you! This writer remembers Avery first attending VAE meets in 1954 at the Lincoln Inn in Essex Junction… often in the inspiring company of John (Hawkeye before Alan Alda) Hawkinson. Avery had a military crew cut, wore a black sweater and smoked a curved-stem pipe. Sort of a cross between Marlon Brando and Albert Einstein. John Hawkinson was revered as an auto guru and drove the cars to prove it. Avery was his quiet and wise sidekick. Time has confirmed the wise part. I wonder what happened to the quiet? Avery grew up in the Charlotte / Burlington area and has long-term connections here. 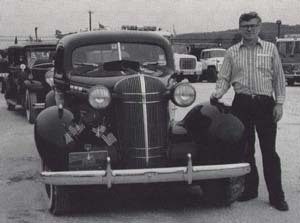 As a younger enthusiast he drove his “old car” as daily transportation. I remember running across Avery in the ’28 Packard sedan on a back road somewhere in south-central Chittenden county as he was transporting folding metal chairs… the Packard was stuffed with them… off to a church supper or wake somewhere. Always the organized and helping volunteer. As I saw more of Avery, and Mahlon Teachout joined our car interest group, we had some interesting times together. Avery told us one time about moving back to Vermont with the family vehicle (think old Packard). The weather was very warm and Avery had questionable tires. Always the engineer, Avery told us that out on the highway in the daytime (it was cooler at night but then there was the issue of headlights), he always tried to drive so as to keep at least 2 of the tires on the white line. He reasoned that the highway temperature would be lower on the reflective white line and that would be easier on the tires. Fortunately for all involved he made it back and has stayed to become VAE President, Board Chairman, Director and Meet Co-chair of major events at Essex and Shelburne. Avery has raised money, written advertising, represented us to the media, judged, and attended hundreds of meetings. In odd moments he has operated Avery’s Garage, taken driving courses, attended technical schools for engine rebuilding, and produced some really nice restorations. He has an additional interest in old boats and I saw him looking with considerable interest at an old airplane at Basin Harbor awhile back… and then there are sports cars. We have many great Enthusiasts in our VAE but few have proved it like “Our” Avery. A big collective thank you comes with this “BIG E” award. Last month, our club recognized early members Bob and Marion Saxby in awarding them a “Big E for Auto Enthusiasm”. We had lost track of these early members and wondered about them, thankful for their significant contributions in our beginning years. 3 members responded early with the news that both had passed on from their retirement home near Morrisville. The Lincoln, sold in NY State, had received a bit of a face-lift and appeared at Stowe some years ago. Our thanks to Doris Bailey, Bill Billado and Adrian West for their responses and information. Adrian knows most about the family history, Doris about Bob and Marion personally, and Bill about their former great car. Should our readers want to know more, these folks would be happy to talk with you. We just wish that we had recognized these true enthusiasts a little earlier.